When it was unveiled at E3 last year, Quantum Break appeared to be a rather puzzling title. Its developer, Remedy, said that it was going to bring the mediums of film and TV and video games closer together. There would be stretches of gameplay in which players would use traditional mechanics to progress through a plot but Remedy also announced Quantum Break would ship with a TV series and its narrative would dovetail with that in the game. An ambitious project to be sure, but for Remedy, it's not a million miles away from the sort of games the Finnish developer has produced in the past. Its previous titles, Alan Wake and Max Payne, were inspired respectively by high-end HBO TV series and every single action movie under the sun. Quantum Break simply picks up the baton from Alan Wake as the latest attempt by Remedy to make the player feel like the star of their own TV show. The plot for Quantum Break reads like a mash-up between Flash/Forward and Fringe. After a time experiment goes horribly wrong at a university, several individuals find themselves able to manipulate time. One of them, Jack Joyce, discovers that he can freeze time in his immediate vicinity. Joyce also learns that the time anomaly has caused the very timeline of humanity to begin to fracture and split. It's up to Jack - and by extension, the player - to prevent the end of time itself. In the meantime, he has to avoid the unwanted attentions of Monarch Solutions, a corporation that seems intent on hunting him down and exploiting his temporal abilities. Joyce's power to freeze time gives him the edge on most of Monarch's operatives. First, he's able to hold enemies in place and move to flank them - to his enemies he's moving too fast to draw a bead on. Second, he's able to stop bullets as they're fired from gun-barrels and return them to their senders in a spray. These time-manipulation abilities aren't just affective, they look achingly cool to use. The basic combat action is standard pop-and-cover third-person, but mixed in with Joyce's superpowers and Remedy's usual cinematic flare players are in for a visual treat; when Joyce hammers a villain with a melee attack, stops bullets in time or blows up a piece of the environment with a hot tracer round, the camera slows to bullet-time and the sound effects become muffled as though the scenes are playing out in a high octane movie. Away from the gunfights, Joyce has to navigate his way through Stutters, pockets of space where time has frozen in place. As he moves through the Stutters, the objects and debris can start to move and in order to progress Joyce has to use his time-freezing abilities to hold them in place. In this way, Quantum Break becomes a mix of platforming and puzzling; imagine a Mario game in which the player had to lay down the track ahead and you're starting to get the idea. Quantum Break looks to be a compelling prospect. While its TPS action is pretty standard fare these days, the game's time-bending mechanics lend it heft and variety. Depth, though, could be the silver bullet. Alan Wake ran out of steam at the midway mark because its mechanics became repetitive too soon. 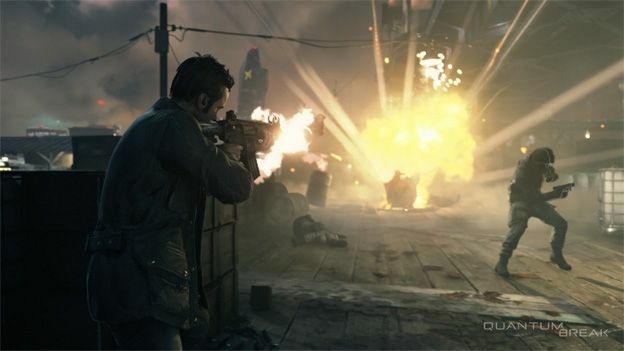 Here's hoping we haven't seen the extent of Quantum Break's features in the Gamescom demo.